An effective approach to the gear noise problem that yields good results is crowning or barreling of the teeth. This technique involves changing the chordal thickness of the tooth along its axis. This modification eliminates end bearing by offering a contact bearing in the center of the gear. Crowned Gears are necessary for applications where noise is a concern and self alignment is required. Crowning gear teeth reduces noise by alleviating misalignment through either assembly or thrust problems. 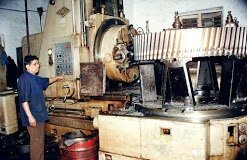 We are able to achieve crowning by crown hobbing in one of our gear hobbing machines, without any additional process. We can do different types of complex and multiple radius crowning based on your OEM design and drawings. As A Crown Gear Manufacturer, We manufacture the following Types of Crown Gears. We manufacture the following types of Crown gears. A second benefit of the crowning approach to gear cutting is the minimization of misalignment problems, caused by inaccurate machining of the casting, housing, shafting, gearboxes, or bearing journals. Crowning can also reduce lead problems in the gears themselves, which causes the gears to wear unevenly and bind because of eccentricities and position errors. Obviously, a gear with a more concentrated centre contact is less affected by discrepant manufacturing or design; furthermore, one can reduce the backlash requirements and allow the gears to wear in rather than wear out. We use the latest two methods of generation of gear equipment while crowning . Both methods produce crowns by increasing and decreasing the center distance of cutter to work piece. So if lower noise levels, higher quality Crown gears are what you require, Contact us by 'Requesting a Quote' Form.